Four new Citrus Heights Planning Commissioners were appointed on Jan. 10, 2019. Top: Andrew Van Duker, left, with Janelle Ingle, right. Bottom: Tom Scheeler, left, with Marcelle Flowers, right. Image sources: Youtube, COCitrusHeights. 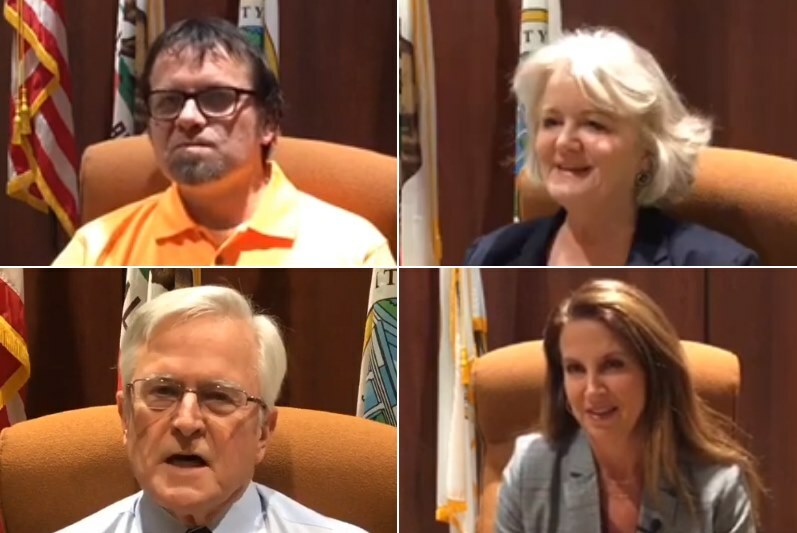 The seven-member Citrus Heights Planning Commission will have a majority of new members this year, following the appointment of four new commissioners by the City Council last week. City Council members nominated and ratified a total of five residents to take seats on the commission, including Commissioner Jack Duncan who was re-appointed to serve another term. The new commissioners will be seated during the commission’s Jan. 23 meeting. Tom Scheeler. Length of residence in Citrus Heights: 35 years. Scheeler is a retired chief engineer for the Port of Sacramento and was nominated as an at-large commissioner by the City Council. According to his application form, his goal is to “help advance the economic health and livability of Citrus Heights.” Scheeler has also served on the Residents’ Empowerment Association of Citrus Heights governing board, as well as serving in various positions in the Park Oaks Neighborhood Association. Andrew Van Duker. Length of residence in Citrus Heights: 35 years. Van Duker is the son of city “godfather” Bill Van Duker and serves as a customer service and sales manager at All Star Printing. He was nominated as a commissioner by Councilwoman Porsche Middleton. According to his application form, his focus is planning ahead in light of declining brick and mortar retail, with plans including “smart rezoning” in areas where decades-old zoning may no longer be the best use. Jack Duncan. Length of residence in Citrus Heights: 60+ years. Duncan is a retired auto dismantler and was nominated as an at-large commissioner by the City Council. According to his application form, his goal is to help make “wise decisions affecting our quality of life and future growth of the City of Citrus Heights.” Duncan has previously served several terms on the Planning Commission and is its longest-serving member. The five appointees will join commissioners Tim Schaefer and Michael Lagomarsino, whose terms do not expire until 2020. Five members of the Planning Commission are nominated to serve four-year terms, with each City Council member nominating one commissioner. The remaining two positions on the commission are two-year at-large positions, nominated by the City Council as a whole. Duncan and Scheeler were both appointed as at-large commissioners and will serve two-year terms, while the remaining appointees will serve four year terms. The Planning Commission meets up to twice a month and is tasked with making decisions on land-use related proposals, approving or denying subdivision requests, holding public hearings and reviewing proposed ordinances. The commission also makes recommendations to the City Council on major projects, as it did for the new City Hall and Medical Office Building project and most recently for Watt Communities’ 260-home development off Arcadia Drive. Historically, the Planning Commission has also served as a stepping stone for leaders to gain experience before moving up to an elected position on the City Council, as was the case most recently with Councilwoman Middleton. The commission recently faced several vacancies, with former commissioner Russell Blair moving out of state and Middleton’s seat being vacated last month after she was sworn in as a member of the City Council. Commissioners Leah Cox and Marcel Weiland did not re-apply for appointment and had their terms expire on Dec. 31, 2018. During their Jan. 10 meeting, the City Council also appointed Manuel Salazar and Jacob Marks to the five-member Construction Board of Appeals. The appeals board meets rarely and only on an as-needed basis to hear complaints from those aggrieved by a decision of the city’s chief building official and also assists in matters related to materials and methods of construction, as well as interpreting technical codes.